Electrical Wiring 101 - F.A.Q. | United Electrical Contractors, Inc.
♦ WATT. A watt is a unit of power that is defined as 1 joule (unit of work) per second. A typical microwave uses between 600 – 1,200 watts of electricity. 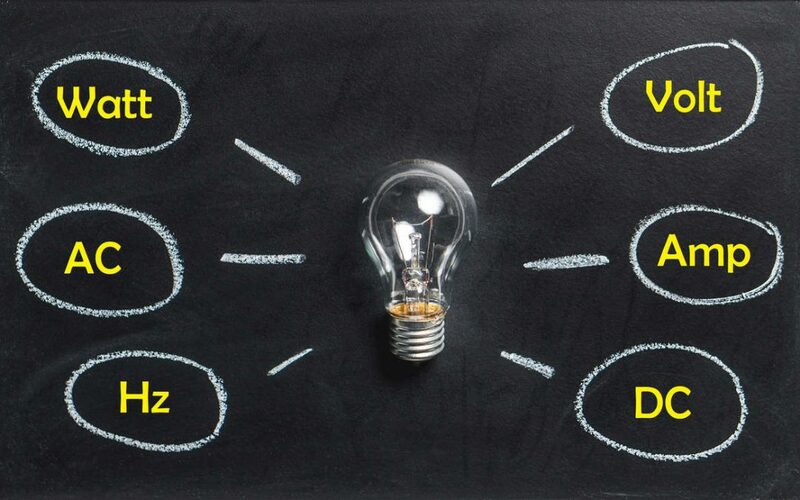 Watts are calculated by using a simple formula: watts = voltage x amperage (Amps). ♦ VOLTS. Voltage can be thought of as the intensity of the electrical signal. 600 volts and up is considered high voltage, whereas a standard USB cable uses 5 volts. ♦ AMPS. Amperage is basically the speed at which the electric signal wants to travel, or push, down a length of wire. USB phone chargers typically use 1 amp, which makes the wattage calculation simple → 1amp x 5volts = 5watts. ♦ Circuit breakers are intended to cut a circuit from power to protect devices or appliances using the circuit. Each C/B shows a number on the main electrical panel. That number is the number of Amps at which the breaker will kick in. ♦ A typical American home has the capacity to utilize 30 total Amps, 120 Volts (although sometimes a tad lower). So, a common home can power up to roughly 3,600 Watts at any time. If you have circuit breakers tripping occasionally that need to be reset, there is probably a reason for the trip. Some wiring is designed to not exceed a certain amperage due to the gauge (size) of the wire. An overloaded circuit can cause it to get really hot! Either the problem is the circuit breaker is faulty, or you are plainly overloading the circuit! Check every device, appliance, and even light bulbs that are on the circuit and add up the amperage. If it exceeds the number associated with the circuit breaker, than you are overloading the circuit! Never, under any circumstance, force a breaker in the closed position. 2. Being unaware of a potentially hazardous wiring situation. Electrical fires are almost too easy to have. Loose outlet connections, worn light switches, extension cables as tripping hazards, are all potentially dangerous. However, with a keen eye (and ear), you can have the perception to save one’s bacon. 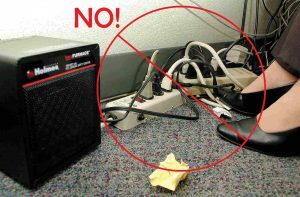 Outlet connections that aren’t fully inserted can spark to nearby electrical conductors, and sometimes they can be flammable. Worn light switches cause a similar concern, as the contact behind the switch is likely not making a complete connection internally. An easy way to find out is to listen to the switch while it is in the “on” position. If you don’t hear anything at all, then there is likely no concern. Worn switches can have a low-pitch buzzing sound. Extension cables should only be used temporarily, and the cable should be secured to a surface as to deminish the likelihood of tripping. A hard jerking action inside an electrical socket as a result of a trip could harm the integrity of the circuit and uncertainties are dangerous. 3. Being able to spot corrosion & knowing the effects. 4. Having general knowledge to not make common electrical outlet mistakes. Daisy-chaining power strips: the most common mistake homeowners make. It’s hard at first to see why it is such an issue, as it just seems like a quick way to expand the number of available outlets for plugging more devices in. What could be so wrong? Power strip manufacturers rate the strips for the number of plugs. Going any beyond that and it can be uncertain if the strip can withstand the additional strain from heat, surging, and in some cases, melting. Daisy-chaining is also a major violation for office compliance. Understanding more how electricity works can turn these easy fixes into common sense. If you have a more specific question, feel free to contact us. We will be happy to answer any of your electrical inquiries.